Welcome to our Frequently Asked Questions page. We hope you find the information you are looking for here. We prefer that you send PDF and EPS files with outlined fonts. Remember to add crop marks and flatten your files before uploading. Which colour mode should my file be? How should I set my bleed and Crop marks? Bleed must extend further than the cut line. Please keep all text and anything you do not want cut at least .125" away from the cut line. When sending a .eps or .pdf, make sure you include crop marks so we can cut the job correctly. The file you upload to BEST DEAL GRAPHICS & PRINTING must have font/imaged embedded or outlined, or else, we will not be able to process your file. Select your text box. Under “Type menu”, select Create Outlines. If the border is too close to the cutline, it may be cut off-center slightly. For products such as business cards, we would recommend customers to avoid borders. If the border is too close to the cutline, it may result in the final product to be off-center slightly. Overprinting refers to the process of printing one colour on top of another. If you do not want this to happen, please make sure that the overprint options are turned off and switched to knockout in your document. In this case, the logo was set to overprint. The colors from the logo are mixing with the colors from the background. Unexpected results may occur if you have accidentally set certain objects to overprint. Always check logos and other artwork before submitting. Transparency effects are generally not preferred in printing, and only on screen. It causes ripping issues and elements to disappear. To prevent this, do not use any shadow, glows and transparency on top of spot colour – always convert your spot colour to CMYK before using any transparency effects. Can I submit a front and a back in the same file? When creating a Spot UV job, You must include a Spot UV template file along with the regular full-color file. The Spot UV template file is used to show where the UV will be placed. Silver ink files must be sent in a vector format. You must use a vector program, like Illustrator or Indesign, to call out the object you want in silver ink. To indicate the silver ink, you must set the object color to Pantone¨ 877 C. Any other color will not be accepted as silver. Also, labeling the layer as "silver mask" or "silver" will not qualify your file. Remember, silver is a spot color and transparencies like drop shadows should be avoided. We recommend using 100% silver, however, we are able to print silver on a gradient and different percentages of silver. We will always require 100% K for black text (C0, M0, Y0, K100). Rich black should not be used for type or thin lines because it will result in fuzziness and misregistration issues. Rich black is an ink mixture of solid black, 100% K, with additional CMY ink values. This results in a darker tone than black ink alone. If you print black alone as 100% K, the resulting black may not be as dark as you might like. We recommend using C 60 M 40 Y 40 K 100. This will give you a deep, dark, rich black. A raster image is composed of a collection of tiny dots called pixels. 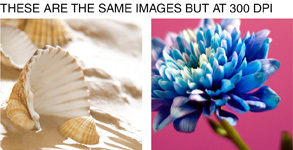 When these pixels are small and placed close together, they fool the eye into forming a single image. Raster images work great when subtle gradations of color are necessary. 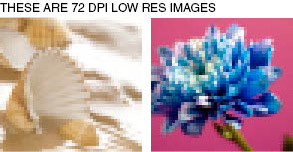 Because they contain a fixed number of pixels, a major disadvantage of raster images is that their quality suffers when they are enlarged or otherwise transformed. Many things can cause banding. Banding can be caused by the program that it is exported from, such as Indesign or Corel. Also, too many gradient steps, for example, going from a very light color to a dark color, in a small area will cause banding. To prevent this, check your digital files before sending. If you use a gradient, make sure it has enough room for a smooth transition. How can Pantone color affect the way my job prints? There are three different ways Pantone colors can affect the way your job prints. The first is by object effects, such as shadows or glows, on top of your Pantone colors. When a Pantone color is under these object effects, transparency issues show up during printing. To avoid this, convert all your Pantone colors into CMYK before submitting your order. The second way Pantone colors can affect your file is when you use transparent images. To fix this issue, convert all your Pantone colors into CMYK. If you need to have a Pantone color in your art, for example when doing a silver 877c job, you must create a clipping mask around the image so the white area will not show up. This must be done before submitting the order. The last way Pantone colors can affect your order is the color conversion between a Pantone color and CMYK. All of our normal printing is done in CMYK unless you specifically order a Silver, MU, or Custom job. If you use Pantone colors in a job that will print CMYK, your job might print with undesirable colors. 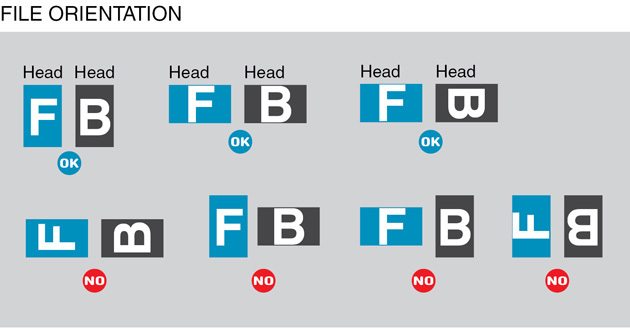 If you send in a job with Pantone colors, the CMYK conversion will change the Pantone color. Before sending your order, make sure all Pantone colors have been converted to CMYK.